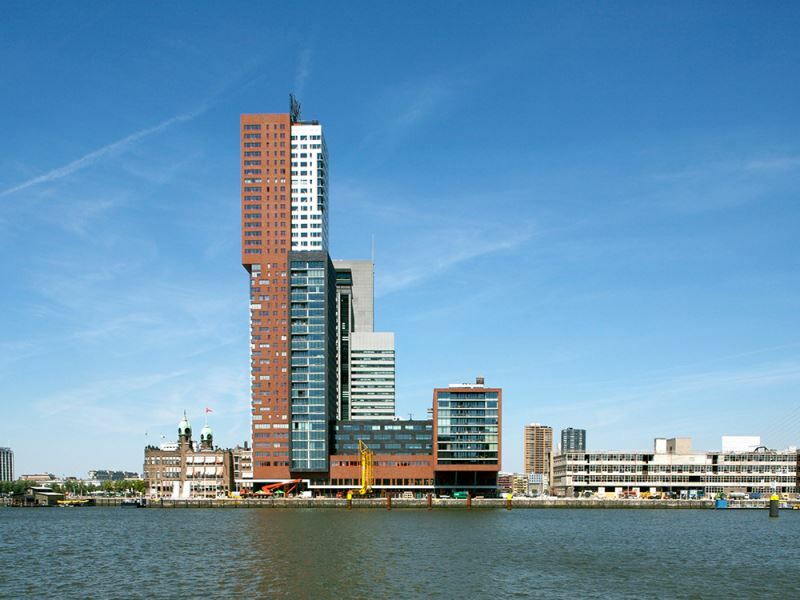 One of the tallest residential and commercial towers in the Netherlands has been built on the Wilhelmina Pier. The building is made up of 44 floors, containing 192 flats offering 54 different residential models. 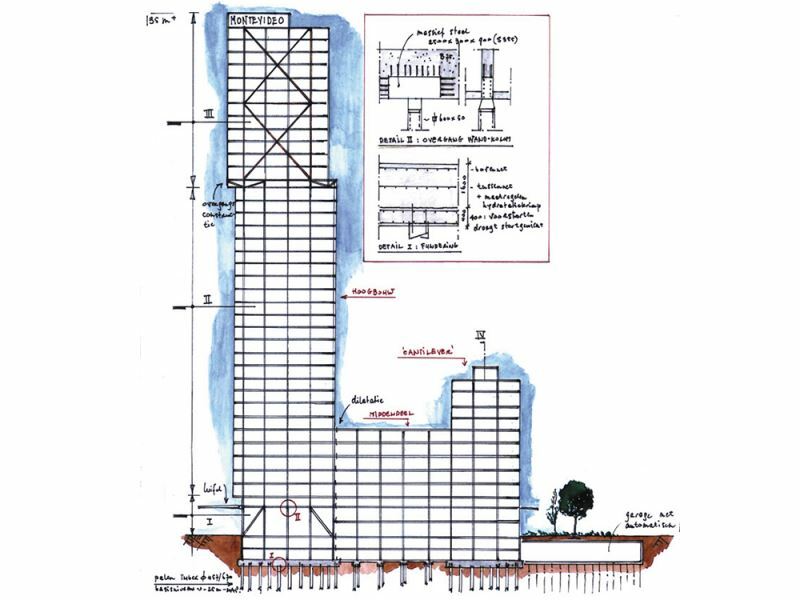 The urban development design for the Wilhelmina Pier by Francine Houben of Mecanoo laid down that the buildings to be erected had to be designed as vertical cities. Metropolitan structures - such as endless rows of balconies - were banned. The Montevideo Tower has evolved into a tautly detailed tower, for which New York's skyscrapers have provided the inspiration. The top three floors form a penthouse with swimming pool. In addition, accommodation for offices, shops and restaurants is to be found in the building. It consists of a concrete structure poured in situ up to the 27th floor. The top levels are borne by a steel structure that facilitates flexible subdivision. The Montevideo also has an underground car park over two levels. By implementing parts of the structure in steel, the building’s layout is not only far more flexible, it is also lighter. It was consequently possible to establish the building’s foundation on the first sand layer. This made the building’s construction cheaper. The tower consists both programmatically and structurally of three components that link up to the function. The ground floor and the first two floors were kept open constructively as much as possible. Strong steel was used for the columns and the concrete core and buttresses provide the necessary stability. Stability is now obtained by diagonally placed steel sections directly behind the façade; the so-called tube façade structure. Naturally, the design of three different structures also meant that bridging structures had to be developed. Heavy beams were developed for this purpose, composed of plates of maximum thickness which are to be supplied according to the S355 quality standard. ABT was responsible for the main bearing structure and the geotechnical consultancy. Montevideo Rotterdam was a finalist in the International Highrise Award in 2006.